PMMS is very proud of four eighth graders who participated at Doe Creek Middle School in New Palastine for ISSMA. Victoria Dearth received a silver medal on her Group 1 solo, and Maria Miller, Savannah Grayson and Chloe Rodgers all received gold medals on their Group 1 solos. 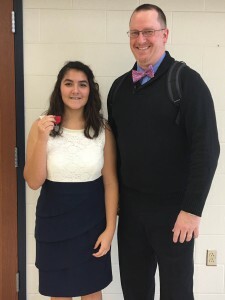 This qualifies the three to the ISSMA All-State competition to be held at Perry Meridian high school on Saturday, February 20. Times will be announced soon. Keep in mind that All-State is only for gold medalists on Group 1 solos, songs usually done by upperclassmen in high school. 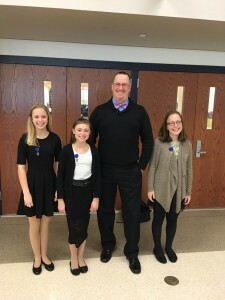 Take some time in the coming days to congratulate these four young ladies as well as Choir Director, Kyp Harasymowycz. Thanks to all parents for supporting our music department!! !